In the eighties, the German Green Party divided. The ‘Realos’ were realists who were prepared to compromise in order to enter coalition and achieve power. The ‘Fundis’ were ‘Fundamentalists’ who preferred ideological purity to compromise. Corbynites present a dichotomy between the unwavering ‘Fundis’, who ‘signpost’ the way to the ‘promised land’, and the Liz Kendall ‘Realos’ who are the ‘weathervane’ and will follow the people there. In reality there is a spectrum of possible combinations of Idealisms and Realisms from the old ‘soft left’, the Brownites, the ‘traditional social democratic right’ to the Blairites. Fundis believe politics is a morality tale and, therefore, that the future is predictable: a principled and honest politics will reap its just reward. Idealism is not only right but, conveniently, also electorally effective. Is Margaret Thatcher a credible precedent for a ‘Fundi’ to win control of a political party and win a British general election? This Corbynite portrayal of Thatcher’s ‘Fundi’ rise to power is inaccurate. Both Campbell and Moore portray Thatcher more as a ‘Realistic Idealist’ who concealed her private views and publicly pursued moderate policies to maintain party unity and appeal to the electorate. Thatcher was not the eternal party rebel like Corbyn. As Education Secretary (1970-74) she did not resign but acquiesced ‘in changes which she later so decisively repudiated’ (Moore 2014: 233). This included the doubling of pupils in comprehensive schools between 1970-74 (Campbell 2001: 227). In 1975, the ‘hard right’ of the Conservative party did have a credible chance of defeating Heath and producing the next Conservative leader. The ‘New Right’, free market policies of Thatcher had, to some extent, already been adopted by Heath in the ‘Selsdon Man’ policies of 1970, although he famously ‘turned’ when challenged by the trade unions. The obvious candidate of the ‘hard right’, Enoch Powell, had left the Conservative party after telling the electorate to vote Labour over Europe. Keith Joseph emerged as the right’s candidate but his campaign self-destructed after he was too honest in sharing his unpolished thoughts about the reproductive habits of the lower classes. When Edward du Cann also failed to stand, Thatcher became the ‘hard right’s’ standard-bearer in the election. Thatcher did not come from nowhere and was not risking her neck: ‘It unquestionably took personal courage for Mrs. Thatcher to put her head above the parapet; but the strictly political risk was fairly small’ (Campbell 2001: 284). Thatcher’s ‘unique’ contribution to British politics, according to Moore, was ‘the art of the impossible’ (Moore 2013: 321) but this did recognize that there were constraints on and consequences for political action. As Leader of the Opposition, Thatcher’s idealism was combined with cautious realism. She needed to retain party unity, reach out to the electorate while encouraging her more radical allies within the party to prepare the ground for change. Campbell argues she fought on a ‘vague prospectus that gave only the broadest hint of her true ambition.’ She spoke with two voices ‘one clear, didactic and evangelical, the other cautious, moderate and conventional – displaying a confusing mixture of confidence and caution. Right up to May 1979 no colleague or commentator could be sure who the real Margaret Thatcher was’ (Campbell 2001: 364-65). Campbell describes Thatcher as a ‘principled opportunist’ (Campbell 2001: 369). Both biographers agree that while she privately opposed an incomes policy she publicly supported it to maintain party unity and because it was perceived to be popular among the public. Charles Moore bluntly states: ‘The difference between what Mrs. Thatcher felt could be said in public and in private was marked’ (Moore 2013: 357). Her heart was in taking on the unions, but her head was with those ‘who argued that a fuzzier, more cautious approach was electorally necessary’ (Moore 2013: 363). George Monbiot argues, politicians reinforce the values they espouse: ‘The harder you try to win by adopting your opponent’s values, the more you legitimise and promote them, making your task… more difficult.’ Thatcher may have reinforced incomes policy but she made use of the ‘Winter of Discontent’ 1978-79 and her subsequent election victory to destroy that policy and deal a withering blow to the trade unions. 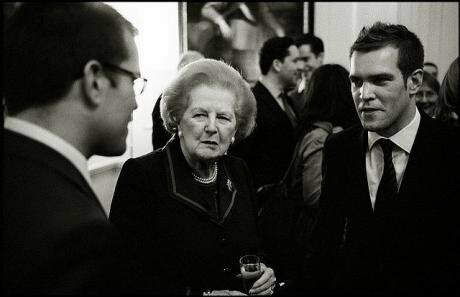 Margaret Thatcher’s ‘spin doctors’, ‘… offered a rather unusual combination of attitudes – a belief in the black arts of advertising and the most modern methods of image-management with a serious ideological commitment to radical Conservatism’ (Moore 2014 384). She communicated by ‘constructing an image of the type of person she was, with attitudes, sympathies and instincts which could be guessed at when they could not prudently be spelled out’ (Campbell 2001: 401). She sold the public ‘a wide repertoire of carefully contrived images which made Wilson in turn look as amateurish as Macmillan’ (Campbell 2001: 401, 402).